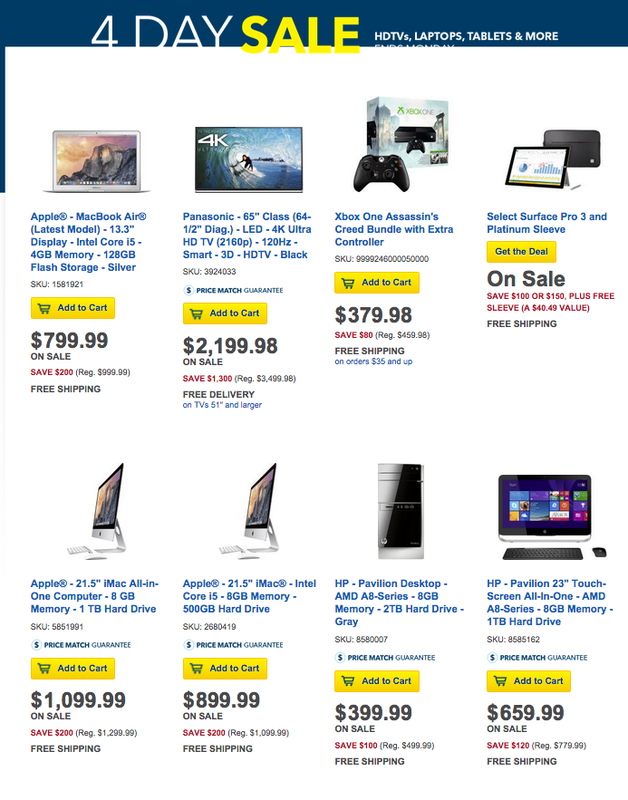 Best Buy is running a special 4 day sale on top of its usual weekly deals. It includes dozens of deals on a range of electronics including select Macs, HDTVs, DSLR camera bundles, home theater gear, and even some blenders. The best deals from the bunch are easily the $200 discounts on select Macs. This discount drops the brand new 13-inch MacBook Air 1.6GHz/4GB/128GB (MJVE2LL/A) down to just $799.99 (Reg. $999). Take an additional $50 off with a .edu email address. Need more power? The newest 13-inch Retina MacBook Pro is also $200 off at Best Buy. What’s more, two current generation 21-inch iMacs are getting this same treatment: the 2.7GHz/8GB/1TB (ME086LL/A) drops to $1,099.99 (Reg. $1,299) and the 1.4GHz/8GB/500GB (MF883LL/A) is just $899.99 (Reg. $1,099). The 27-inch model 3.2GHz/8GB/1TB (ME088LL/A) can be had for $1,499.99 (Reg. $1,799). Again, anyone with a .edu email address can get a coupon to save an additional $50.